quality of our life, as well as an obvious expression of our inner condition. What would become of us if we were deprived of our healthy white smile? There is a variety of dental implants, therefore it is important to chose quality implants from trusted manufacturers; your quality of life will depend on it quite literally. Undoubtedly, the experience and expertise of your implantologist is of no less importance and, in some cases, it might be crucial. There‘s a great difference between having to take care of your teeth your entire life or taking care of it for once and for all. 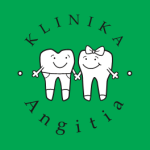 Clinic „Angitia“ is one of the first dental clinics that have opened in Kaunas; since then we have been using screw implants Nobel Biocare made from highly refined, solid, durable and hypoallergenic titanium. These implants have been on the market from the very start, as well as having been perfected ever since. They are of the highest quality, durable, ecological and certified both within Lithuania and the EU. The quality of Nobel Biocare implants is a guaranteed success for life in the hands of experienced dental professionals. 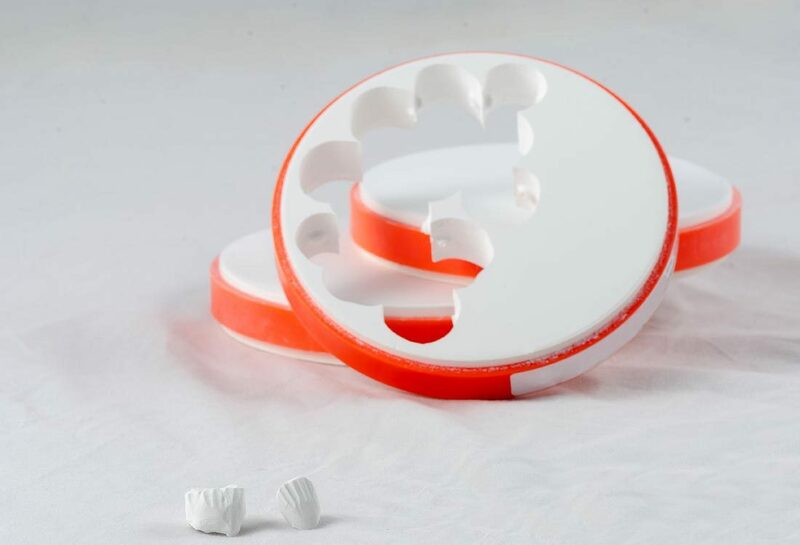 The base of an individual tooth is screwed on top of the implant and later is made from highly durable white zirconium; its colour is identical to that of your surrounding teeth. 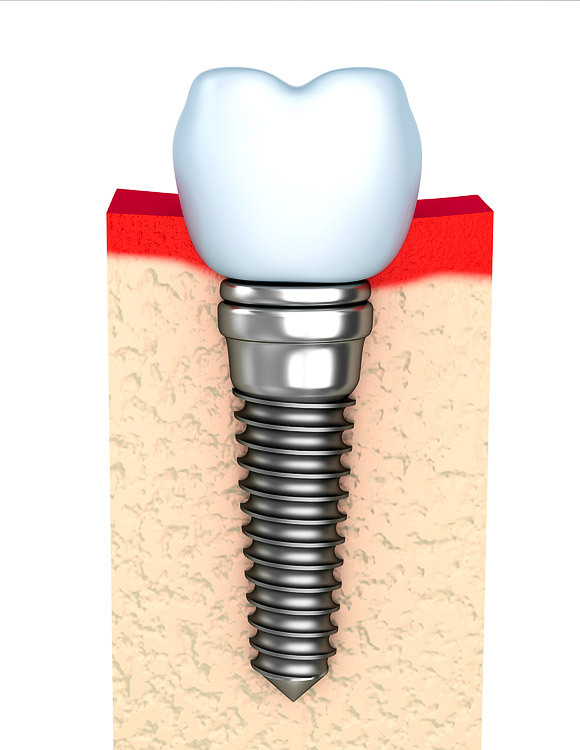 A screw implant is similar to a small solid dental screw that is inserted into the jawbone; it is made of hypoallergenic titanium and at the same time it imitates and replaces the missing root in all respects, except that it cannot compensate for its vital functions. 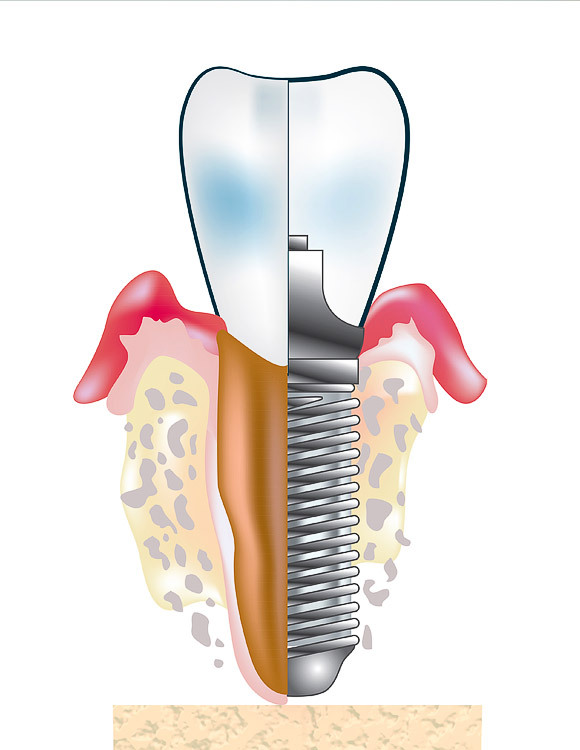 The dental implant is inserted through the gums into the jawbone, in place of the former root of the tooth. Once it‘s settled, it takes on all the usual functions of the original root of the tooth, the main of which is preventing the jawbone from deterioration or atrophy. 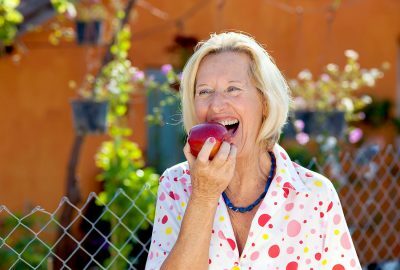 While chewing food, just like the ordinary natural root of the tooth, the dental implant stimulates the jawbone thus sustaining its function and preventing it from deterioration. 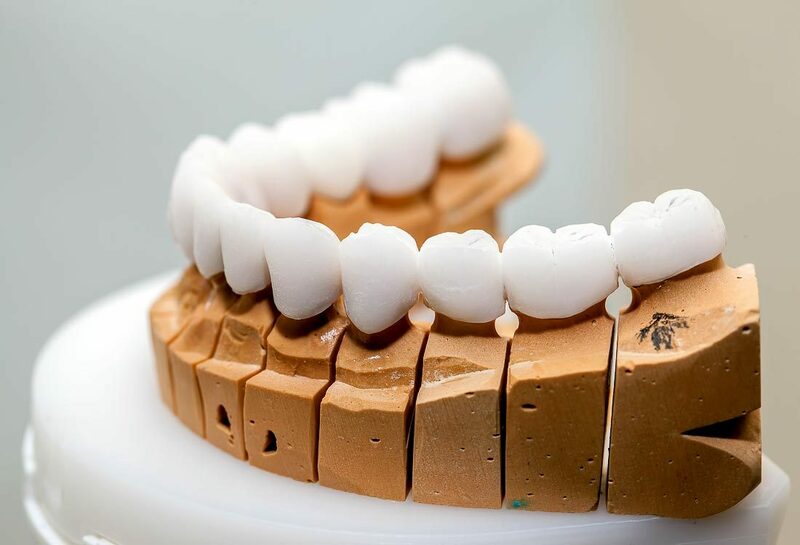 After being inserted into the gums, the Nobel Biocera implant merges with the jawbone in 3-6 months time and sustains the crown in place of the root of the tooth for the rest of the person‘s life. The Nobel Biocare implant guarantee is valid in 70 countries with Nobel Biocare agencies present. This means that our clinic extends you the opportunity to seek free medical attention in any of the world‘s dental clinics that have a working contract with Noble Biocare implants, in case there is such a need. It‘s very convenient for those patients who travel a lot or stay abroad for a longer time and have implants that were inserted in our clinic. The guarantee is valid even in cases where the patient was risking inappropriate use of the implants inserted, i.e. other purposes than chewing food. do not try unscrewing bottles with metal stoppers. It‘s worth mentioning that dental clinics cannot repair dental implants belonging to a different manufacturer other than the one they have a contract with; this is mainly because they only have the equipment necessary to work with a particular manufacturer‘s dental implants. Every manufacturer provides the equipment necessary to accompany the implanting procedure and its further back-up.. That‘s why it is very important to inquire about the reliability of the implant manufacturer. Our dental clinic can help you with a variety of surgical and prosthetic procedures as we have the necessary equipment and work experience with several other implant manufacturers, such as 3i, Astra tech, Straumann, Ancylos, Biohorizons. In case of natural tooth loss or any issues with Nobel Biocare or any other dental implants, do not hesitate to book an appointment with us.